Gear ratios, circular pitch, mesh, RPM -- lessons from my college Mechanical Design class flashed before my eyes when I first previewed The Robot Book by Heather Brown. Why? This board book contains a bolt, a nut and several interactive cardboard gears. And it's hard not to think of all those lessons when I see two gears mesh together. Now, this is not at all an informational book about gears, machines, or how they work, but more of an entertaining "touch and play" perfect to engage toddlers' minds. In my experience, kids love interactive toys and books -- anything with moving parts or flaps that open. Kids love robots, too. 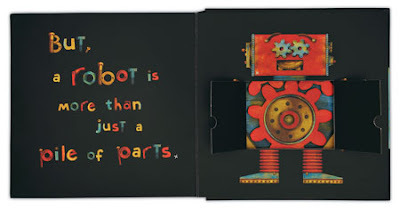 The Robot Book combines both these kid friendly elements into a short and sweet book about a robot's parts...mouth, eyes, arms and something else special on the inside. The book reminds young and old of an ever so important message...it's what's inside that counts! Preview the entire book in the following YouTube video. 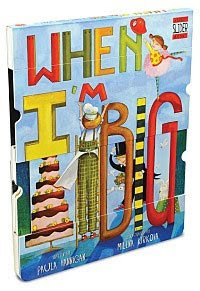 Thanks to Accord Publishing, one Brimful Curiosities reader will win a copy of The Robot Book and a copy of another Accord favorite: When I’m Big! To enter, leave any comment relevant to this post. Or, do you have a favorite robot book? • Contest ends on Monday, November 15th 2010 at 11:59 PM CST. You know I don't think we have any robot books..... Kind of surprising. But of course, if I win, I will. my boys think they are robots... hahaha! This will be a great gift for them. I follow your blog. 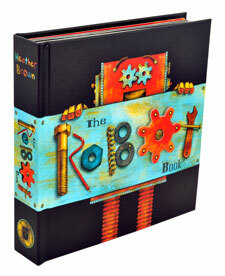 The Robot Book looks very cool, I know my toddler would love it! I am also in love with the darling video they made to promote it! My son loves robots, so I know he would love this book! What a fun review.. Yes, she did have a great party.. Enjoy your day.. I like Me and My Robot by Tracey West! What a fun book! My girls would love it! My 15mo daughter loves interactive books. We don't have any robot books yet, but her daddy and I love the Wall-E movie! This sounds like I would spend more time playing with it than anyone else. It was one of those things that I always wanted to do with my students - build their own robots and enter competitions, but just never got it done. I would love to have these books to share with my grandson. It would be right up my alley. I follow you on Twitter and tweeted about this giveaway http://twitter.com/#!/ossmcalc/status/29642852163. I also left out my email address in the previous posting. Hope that this will be enough to have it in this one. When I hear robot I think of Robot from Lost In Space "Danger Will Robinson, Danger". The Star Wars robots were much better. I have two recently released picture books that I illustrated for Accord, and as I was looking for my books on Accord's website, I saw this one and longed for it. It looks like so much fun! My son would love this, he's big into robots. He has a pop-up book from the movie Robots that we found at a sale and its one of his favorite books. We love interactive books in our house too (and robots of course.) It's sounds like a book that would keep my little one entertained too! We don't have any robot books. Our grandson would love this one! I work with robots for a living and my son is a robot freak! I have never even heard of a Robot book. But I think my daughter would like it. Please enter me. Thanks! This book sounds perfect for my more than reluctant reading son! Maybe it will be the book that changes his mind on reading, ok I can always hope! My grandson would have fun with this book. Isaak likes the book Rusty Robot. I could use a robot book in my home!!! We are just getting into robots around here. We'd love to win! I also follow you in Google Reader! This book looks like a wonderful way to encourage my child's imagination. He is always creating robots with his Lego's and I know he would love this.